Editor's note: This article was first published on April 22 at 4:23 p.m. EDT and has been updated. After just six years of service in the fleet and some a bit of controversy, the blue-and-gray cammies could be headed for Davy Jones' seabag a museum exhibit. aquaflage Navy Working Uniform Type I could soon be on it’s way to mothballs. The digital blue Navy Working Uniforms were a fleet mainstay until 2013 after they were found to be unsafe to wear while fighting a fire. One plan is ditching these blue Navy working uniforms in favor of their green cousin. The service could potentially save millions by switching to the woodland cammies already worn by Seabees and master-at-arms. The green-and-tans are also not flame-resistant but would be the standard for ashore wear; flame-resistant coveralls and flight suits are mainstays for at-sea wear. Under a proposal currently being considered by Chief of Naval Operations John Richardson, the service could ditch the blueberries in favor of it's green cousin — NWU Type III. Dumping the digital blues, also known as the NWU Type III, is a move that's been quietly discussed by leadership in recent years. It’s a move whose idea has been popular with many sailors — especially those who have worn the Type III — and one which has been talked quietly by leadership since at least 2012. "I think that there are a lot of folks who wouldn't be sad, I guess, if Navy working uniform Type I went away," Chief of Naval Operations Adm. John Richardson said in an interview. He’s heard sailor's complaints that the heaviness of the fabric makes it hot from shoulders to boots. Sailors have told him it's the heavy weight of the uniform that makes it hot to the boots, sailors tell him are "very uncomfortable," he said. Sure, the blue NWUs have been popular with those who like the battle dress-styling. But its camouflage is an open joke. Sailors have called it their "blueberries" and gagged that their foremost value is concealing paint spills. Even the Navy secretary has mocked it, saying three years ago that "the great camouflage it gives is if you fall overboard." Time to ditch the blue cammies? Send us your uniform suggestions at navylet@navytimes.com. What it all boils down to, he said, is mission readiness. "Well the uniform is a huge part of that," he said. "Right?" 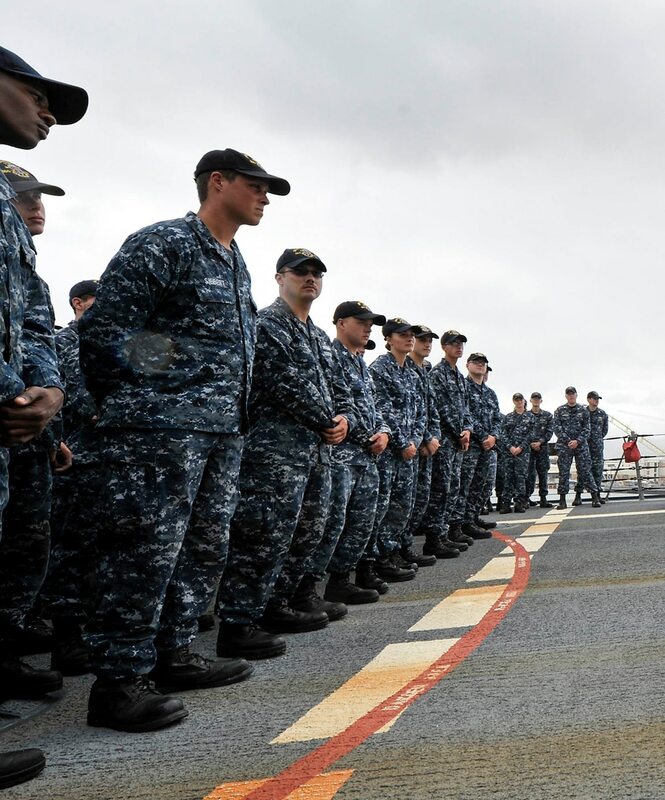 Richardson, who signs off on all uniform decisions, wants to make sailors' uniforms more functional and to achieve the aim of many previous CNOs: slimming down the seabag, a move that will save the service millions of dollars. Another option to accomplish that is to dump the poly-cotton utility coveralls; like the NWU, these uniforms will melt in a fire but are still issued to every sailor. There's a possibility that the service could make a custom seabag for different types of duty or add a flame-resistant uniform to the seabag. "Let’s take a look at the whole sea bag and see if we can’t bring – make it a little bit more sensical, whereas the elements of that sea bag are more suited to their mission," he said. "They are comfortable, they are effective, we can wear them more broadly so that we don’t have people having to change in their workspace before they have to drive home." Other uniform proposals competing for Richardson's attention involve also replacing the current poly-cotton coveralls with a fire retardant variant that's already under development. The future of fleet uniforms is also up in the air. Fleet sailors are testing two prototypes of flame-resistant uniforms: one a traditional coverall design and the other a blue flightsuit style. In addition, Navy officials have blueprinted a hybrid of the There are many competing designs under consideration, including many that look like a hybrid coverall and flight suit combination, sources familiar with the discussions have told Navy Times. Walking away from aquaflage in favor of the woodland pattern NWU type IIIs is a tough decision and won’t be easy to execute, but it is being discussed. Richardson confirmed he’s mulling the uniform changes in an April 13 interview with Navy Times. "In terms of NWU Type I, NWU Type III, [and] the coverall: All of those things are being considered," he said. "Those things I think would allow us to look each other in the eye and say, 'This makes a lot more sense than some of the schemes that we have now.'" GSM2 Evan Peterson, from the USS Carney (DDG-64) demonstrates the new Improved Flame Resistant Variant flightsuit at Naval Weapons Station Yorktown in Yorktown, Va., on Thursday, September 10, 2015. Sailors are wear-testing two uniforms to replace the ill-fitting flame-resistant coveralls fast-tracked to the fleet. 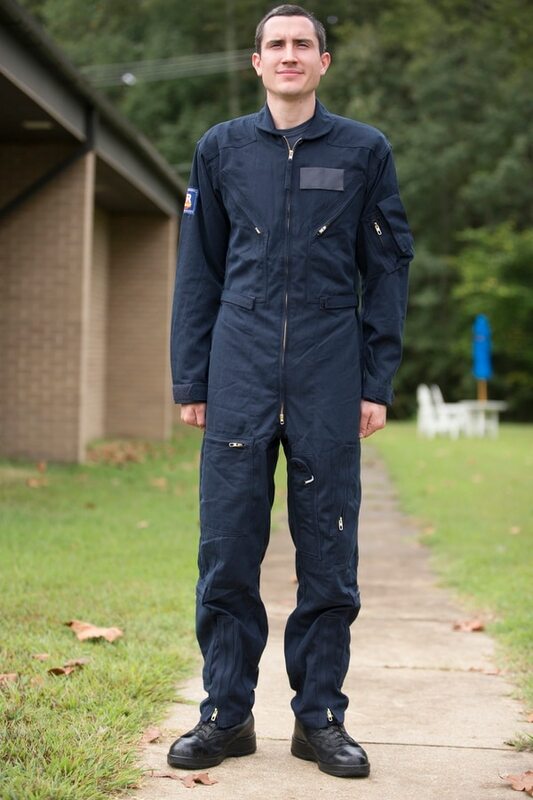 The options are a standard coverall with flame-resistant fabric, or a blue flightsuit style. It could be a good time to dump the blueberries. Congress is pressing for cost-savings by consolidating the explosion of service-specific camouflage to what concealsworks best. But maybe, multiple sources tell Navy Times, with Congress hot on getting away from service specific camo patterns and the millions spent in pursuit of those dreams during the past two decades — the time could be right to make the break. The Navy has spent $224 million just to develop and initially field the NWU Type I's, First, there’s what the Navy spent to even field the uniform, which according to a 2010 Government Accountability Office report cost the taxpayers $224 million. Price tag included the research and development costs as well as the initial fielding. Currently the Navy stockpiles keeps more than a year’s supply of the NWUsuniforms in stock with the Defense Logistics Agency, spending $15.4 million in fiscal 2015 to buy 200,059 trousers and 224,232 blouses; plans as of mid-2015 called for the spending of even more in fiscal 2016. Another issue is modifying or breaking the existing contracts through DLA. is that there’s currently contracts through DLA to produce the uniforms that would cost money to break or possibly retool. In 2015, DLA told Navy Times that two contracts that govern the purchase of NWU Type I trousers and blouses. That agreement will expire in 2018. A separate contract for the poly-cotton coveralls, which can't be worn in the fleet, will expire in 2019. The good news is that these "indefinite-delivery indefinite-quantity" contracts give the Navy some flexibility to draw down its stocks, but the Navy must still purchase a minimum amount. One contract has a minimum buy of 50,000 units. The other is a bit tricky. It encompasses production of four different types of uniforms, with a minimum of 104,000 units per year. The NWUs were envisioned as the service's everyday uniform, to be worn in classrooms, at shore-based commands and in ships and squadrons. Accessories like the fleece and parka were offered to make it wearable in cold and wet weather. But It could be worn with a fleece or parka in cold or wet weather. But Because the uniform has since been ruled considered unfit for wear aboard ships while underway to be worn underway on ships after revelations it would melt and burn up in a fire, and officials are asking whether it should continue to be a seabag item. as flammable, questions have arose over its continued viability as a seabag uniform or even as an in-port or shore duty uniform. Declining sales and lack of use underway prompted the service to cut the seabag requirement for Type I’s from four pairs to three last year. At the time, officials hinted on background that move would start a signaled gradual phase out of the uniform as it is, now. Even so, the service has spent money developing lightweight blue NWUs. 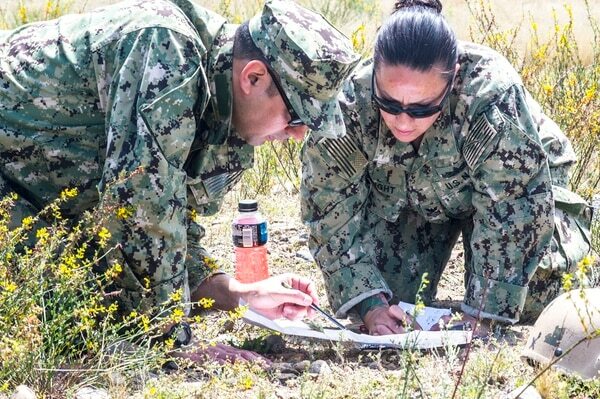 160415-N-DM338-104 MARINE AIR STATION MIRAMAR EAST, San Diego (April 14, 2016) Mass Communication Specialist 1st Class Jerry Jimenez and Mass Communication Specialist 1st Class Kleynia McKnight practices land navigation during a Navy Reserve Combat Camera Pacific annual field exercise. Combat Camera Pacific deploys trained documentation teams to hostile environments supporting the Navy's strategic, operational and tactical objectives. (U.S. Navy Combat Camera photo by Mass Communication Specialist 2nd Class Nicholas A. Groesch / Released). Navy officials are considering dumping the blue-and-gray digital cammies for the woodland pattern, which many feel to be more comfortable. Many prefer the woodland cammies, saying they're Those who have worn the Type III say it’s much more comfortable in a wide range of climates. it’s design and material make it comfortable in a wide range of climates and much more suitable as shore duty uniform. What’s more, outfitting all hands with the same cammies would make the service more uniform and likely save millions every year. is that putting everyone in the same camouflage working uniform would help another issue of unfairness in clothing allowances, to and could eventually save the Navy millions each year. According to Navy Uniform Regulations, all enlisted sailors are required to maintain their complete compliment of aquaflage uniforms the service issues in good working order — including the three sets of blue NWUs, because they are considered seabag items and are issued at bootcamp. With seabag items, enlisted sailors get an initial issue and then are required to maintain those uniforms with the money the service pays them in their annual clothing allowance. Not so with organizational clothing, where Type III's fall right now. When sailors wear out those items, they simply turn in the worn-out item to the supply office and get a new one issued for free. Thousands in the Navy wear woodland cammies full-time, NWU' Type III's as organizational clothing full-time, including Seabees, SEALs, explosive ordnance disposal sailors and divers; they rarely, if ever, take their blue-and-grays out of the closet. never pulling out their Type I's out of the closet -- if they even have them at all. Others, like sailors attached to Navy Expeditionary Combat Command units, won't wear their blueberries as long as they're on a NECC tour of duty. Some 50,000 sailors are paid to maintain three sets of blue NWUs, at $215 a pair. Getting rid of this requirement would thus save the service around $10 million a year in organizational clothing costs for purchasing Type III's. To be sure, the service would also need to buy more sets of the woodland NWUs, which reportedly have a higher cost than the digital blues, making it unclear how much of the savings the service would see, though with larger purchases, the per-unit cost will naturally drop. By the rules, all sailors are required to maintain their blue NWUs - all four sets - and they are compensated for that each hear. But in practice, they never wear those uniforms, they simply pocket that portion of their uniform allowance each year. In 2012 when Navy Times looked into the issue, the cost was roughly $215 of extra cash per person. Navy sources tell Navy Times that at any given time there's roughly 50,000 sailors Navy-wide wearing either the Type III uniforms in their current jobs. This means, Making Type III the Navy's official working uniform could save the service as much as $10 million annually. because as a seabag item these would get an initial issue and then replace them with the as they wear out with their clothing maintenance allowance as there would be no more free replacements. But that's not all, the NWU and coverall shakeups would only be a part of a potential total seabag slimming that Richardson feels is necessary, sources tell Navy Times, as he believes sailors are asked to haul too much around with. Slimming the seabag is easier said than done. Many before have tried to tackle ita burgeoning seabag. Few have succeeded in the end. But Richardson, a career-long submariner is looking at the complete seabag with a system approach. "I guess it is just my nature sometimes… I want to look at the whole thing," he said. "Let's take a look at the whole sea bag and …make it a little bit more sensical whereas the elements of that sea bag are more suited to their mission." Uniforms, he said, should be comfortable and effective and of a nature that "we can wear them more broadly so that we don't have people having to change in their workspace before they have to drive home," he said. Beyond saying that nearly everything is on the table, CNOhe didn’t say much about which way he is leaning, yet. "These are important decisions and so you want to do them thoughtfully," he said. "I would say that in the next few months we might be ready to come out with sort of our next step forward in that area."